Abebe has been a trustworthy partner in Ethiopia since 2007. 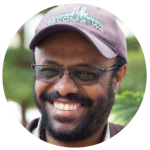 His gentle guidance and wisdom coupled with absolute integrity make him a valued overseer of our work in Ethiopia. Abebe is married to beautiful Abonesh and they have three children. 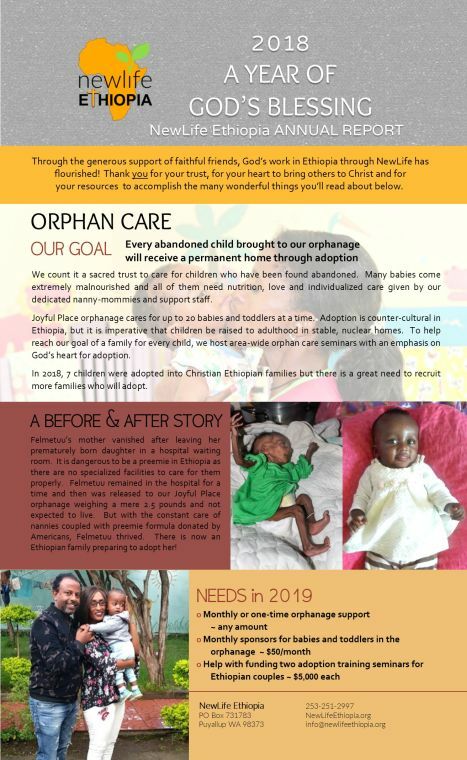 Abebe’s two passions (after his family) are orphaned children and reaching the unsaved with the Good News. He energetically reaches out to both. Every organization needs a highly trained, ethical accountant like Abonesh, bringing a wealth of experience to her job. 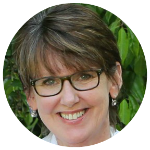 She approves budgets, facilitates wire transfers to project areas, prepares for audits and generates monthly financial reports for every ministry program. 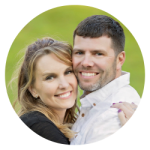 NewLife’s financial health is in excellent hands! 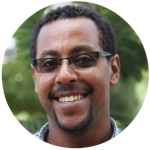 Abonesh is married to Abebe and assists him with many of the other responsibilities for the ministry. Ephrem is the director of our Mana Gammachuu orphanage in Shashemene and also oversees the kindergarten. His education and prior experience with non-profits coupled with his ability to effectively interface with government officials makes him a key leader. Ephrem is married and has two little girls. Their family is active in Gospel Light Church in Shashemene. The 38 missionary evangelists working with least-reached or unreached populations are trained and mentored by Pastor Zerihun. His expertise is in identifying and training leaders, planting churches and evangelism. But what is most valued about Zerihun is his integrity and vision. He is a man of prayer and tirelessly pursues God’s heart to reach people with the Good News. 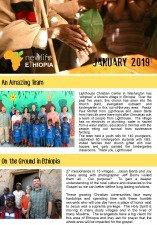 Miki is helping to start a ground-breaking outreach to kids and teens whose parents are new believers from several rural congregations in Ethiopia. He has wonderful mentors and pastoral oversight to help him pioneer this much-needed ministry. Miki is a college graduate with a degree in psychology and many years of active ministry to street kids. He is passionate to see young people grow in their walk with Christ. Abu (Ah-boo) is young and not yet married but he is clearly a leader. He lives in the village where the school is located and is actively involved in the church there. He is passionate about bringing the gospel to all of the children in the school. He has one year experience teaching first grade. By the end of the year the children should be reading and adding and subtracting simple problems. His goal is to prepare them to enter first grade and reading is a must. Chala is married and has two children, ages 5 and 3. He lives in a little town next to Bulbula and commutes to school. As a certified teacher, he has taught third grade for seven years. His curriculum for the second year of kindergarten is music, art, introductory English, Oromo, basic math (counting and simple addition) and the building blocks to reading simple words. Lelo is married and has three children. He lives in a nearby village. He is a certified teacher, which means he has a 10th grade education + 1 year teacher’s training. He has three years experience teaching pre-school. His goal is to teach the children through play to recognize the alphabet and the sounds of the letters, to count and know numbers, know colors & shapes and to be exposed to stories about Jesus.